We produce custom high quality printed tapes in PVC, PP solvent, PP acrylic and hot melt, guaranteeing the best print resolution for custom printed packaging tapes. Thanks to our flexibility, we provide custom printed tapes from a minimum order quantity of 72 pieces. We produce custom printed tapes satisfying all kind of requests. Thanks to our materials, we always advice the best custom printed tape for your packaging needs. Contact us for a free estimate from a minimum order quantity of 72 tapes. Visit our Magazine to keep up with the latest news about our custom printed tapes. Printape is the best partner for all your packaging needs. With Printape you will always obtain the best solution to pack, protect, seal, wrap and palletize. We offer the best solutions for custom printed tapes: our objective is satisfying any kind of our clients requests. Your brand will travel all around the world with our custom printed tapes! We offer a wide range of products for the packaging, the masking and the attachment. Check our catalogue, you can find all our products. Printape is in a continuous evolution for a constant research of the best quality and best resolution of custom printed tapes in order to offer new materials and solutions to our clients. Supporting the client at 360°, providing high quality and resistant material, guaranteeing high performances of the products in order to keep high the quality standards of our materials. Quality, professionalism and flexibility are our strong points and this is the attitude we present ourselves in the field. Our clients request custom printed packaging tapes to protect their shipments from forced entries and especially to gain more visibility and promoting their brands. Custom printed packaging tapes: the custom printed packaging tape is useful for any kind of business, to promote your brand and advertise your products all around the world. Adhesive tapes for any kind of packaging. 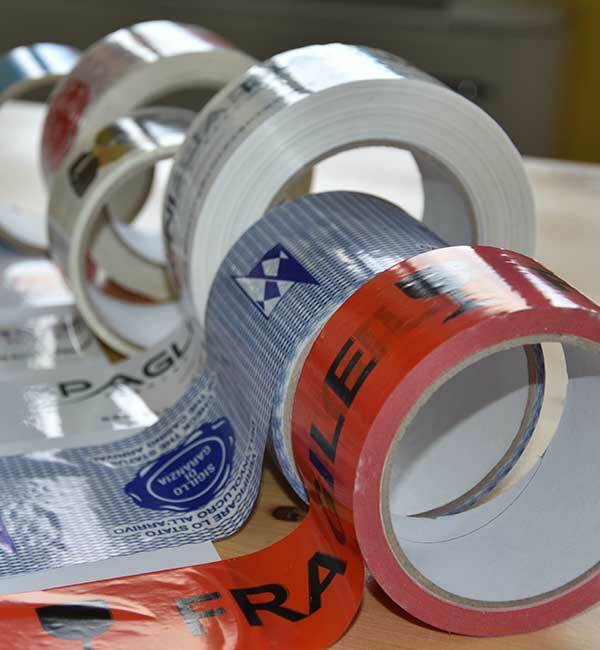 Bi-adhesive tapes that offer solutions for many industrial applications. Adhesive paper tapes are mainly used in industrial employments, in DIY works, bricolage and in many more activities. Stretch films for manual use for pallet packaging since it is resistent with an excellent clamping force. Plastic bags, minigrip bags and micropore bags for the air leakage. Reinforced tapes are suitable for all the closures that require high resistance. Bi-adhesive tapes are mainly used in the gluing field.